Choose the Email Branding that is Right for You. We make it easy to manage your email branding. Choose the right plan to match your growing needs. Manage your business email image, take control of your email branding, and save time and money. Our email signature product is compatible with every email platform. The professional look and feel of our eSignatures are a virtual handshake to your customers. YOUR NAME. Your name is important, tell people who you are! YOUR TITLE. It’s nice to know who’s reaching out and why. LOGO. A logo is one of the first things a customer will recognize! Many customization options are available for you to mix and match so you can optimize your brand’s impact. PERSONAL PHOTO. Your photo can be displayed in every email you send! Customization options are available for you to mix and match so you can optimize your brand’s impact. ADDRESS. Tell your clients where you are located. PRIMARY PHONE NUMBER. List your main number for your clients to reach you with ease. FAX NUMBER. An easy access to your company’s fax number. MAP & DIRECTIONS. This link will connect to a street map of your business. Customers can plot directions to your office and use their mobile device for visual or audio GPS navigation. Personalize your email with custom upgrades! Options will vary in style and positioning depending on which eSignature style is chosen. Get a jump start on your email branding now. Order Now! *Depending on what email platform you have, all software features and benefits may not be available. Please refer to the pricing guides for specifications. What are the benefits of using Brand My Email? Unlimited email branding increases visibility, creating fully engaged customers. 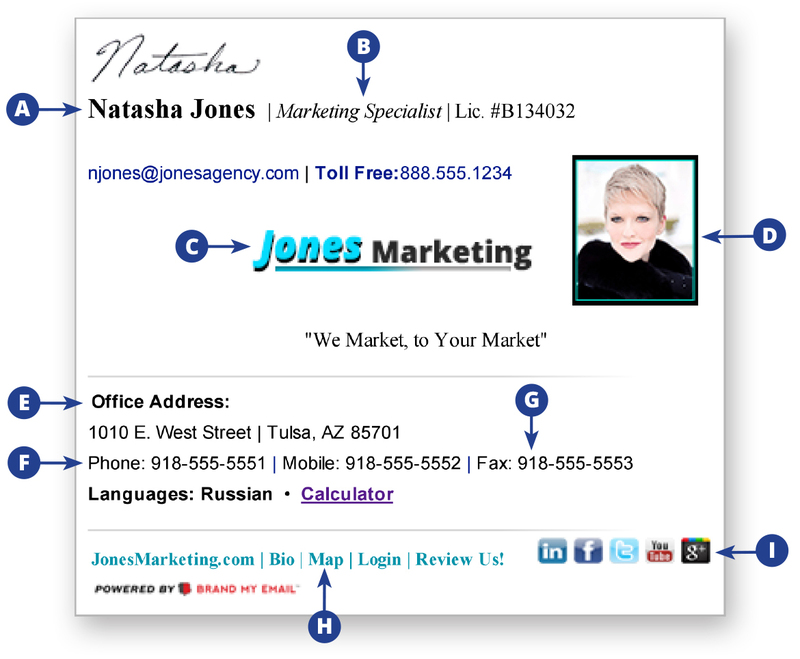 Clients are one-click away, from maps, web links, and social media. Your branded email is a way to create brand ambassadors of all users, increasing your brand awareness and ensuring corporate branding standards. What is the design turn around time for my branded email? Design times vary depending on what product you order and how fast you get your information to us. Once we have all your information it can take anywhere from 1-2 weeks if we get approval quickly. If there are edits the process can take a little longer. 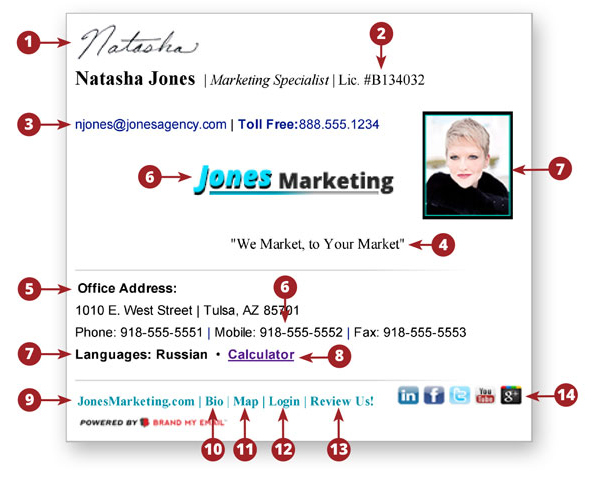 How do email signatures work? Your eSignature and eStationery will be installed on the email platform you use by you. We will provide step-by-step instruction so that you may install with ease. We also have personnel standing by to help you should you need a bit of hand holding. Our team is well equipped to walk you through the process. Are Brand My Message emails designs under copyright? Every design we create is protected under general copyright laws. This means that nobody else can copy or replicate the design and use it in their emails or products in any way. Should you come across a similar design, please let us know. Credit card payments paid via Master Card, Visa, American Express or Discover are accepted at the time a quote is approved for a design order. 1. Choose your customized package and request quote. 2. Receive and review a quote based on chosen package and options. 3. Send approval of quote to brandingadvisor@brandmyemail.com. 4. Credit card is submitted and charged. 4. Receive questionnaire, fill out the information and return to tracyk@brandmyemail.com. 5. Design Center creates proof for review. 6. Receive proof, make any changes needed and approve. Edits may be submitted and corrected at this time and re-proofed. 7. Once proof is approved, final design is created. 8. Final files are sent to you along with the installation manual. 9. Your email is branded! MORE QUESTIONS? CHECK OUT OUR FAQ PAGE! All packages feature a base of the following assets: photo, logo, banner, name and title, address, phone, fax, website link, email link and map link. Additional links and features are outline in each package. Email branding software is sold using a monthly subscription model. 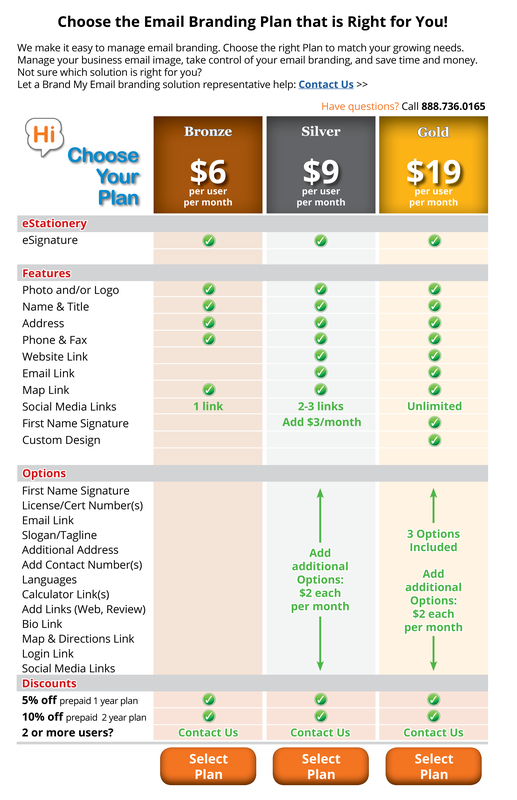 Pricing per user, per month is outlined below with different software options. *Corporate pricing is available, please call for details. We'd LOVE to chat with your about our products and tell you more.